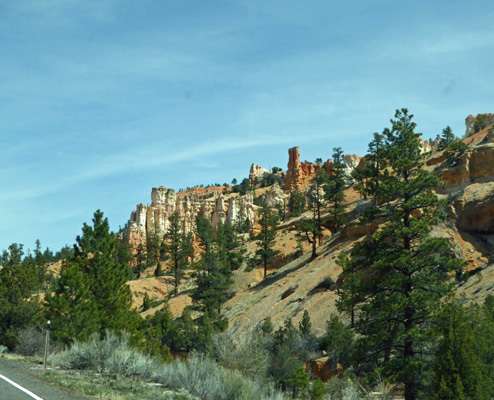 On Wednesday April 13th we broke camp in Escalante UT and headed west on Hwy 12 back through Red Canyon (west of Bryce Canyon). This is in the Dixie National Forest and there’s a campground here that would be lots of fun to camp in. But it’s not open this time of year. There are bike trails (both paved and unpaved) and lots of hiking trails too all in amongst this lovely pink and red rock. 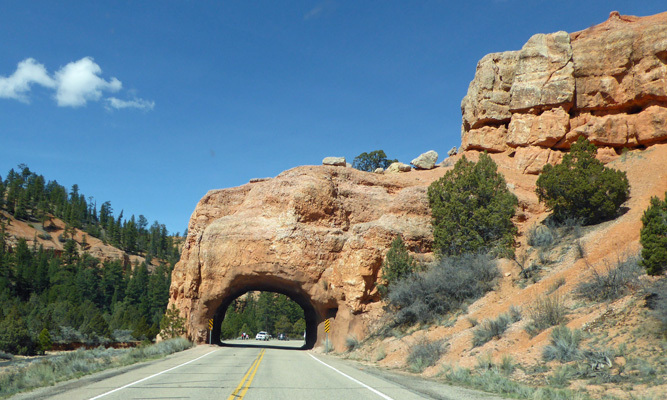 Along the way through the Red Canyon the road goes through two short tunnels--way fun to photograph as you ride along. Both tunnels have parking at least on one side so you can stop and take photos if you want but when we’re towing the trailer there’s rarely space big enough for us and I had more fun shooting through the windshield anyway. 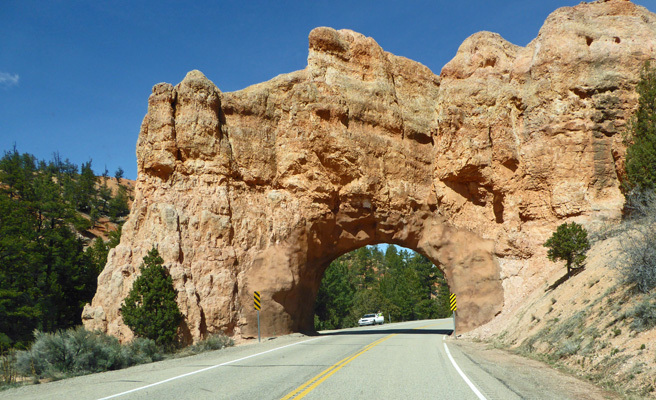 We followed Hwy 12 until it meets Hwy 89 and turned north on 89 for a low-key drive up through Central Utah. Following our own guidelines, we picked a place to camp based upon not driving more than 200 miles a day. That put us in Manti, UT for the next two night (drive less than 200 miles, stay at least 2 nights everywhere). We found a spot at the Temple Hill Resort for only $18.18 a night with our Passport America membership. It’s an older park but it was in good shape and their WiFi was really nice. We did laundry and grocery shopping on Thursday April 14th and got it all done before the rain started that night. Once the front passed the temperature dropped and we had a low of 30 degrees on Friday morning (it had only been down to about 46 the night before). We broke camp on Friday April 15th, glad that we hadn’t connected the water hose (fighting with a nearly frozen hose is no fun first thing in the morning) and that we’d dumped our tanks the afternoon before when everything was still dry. 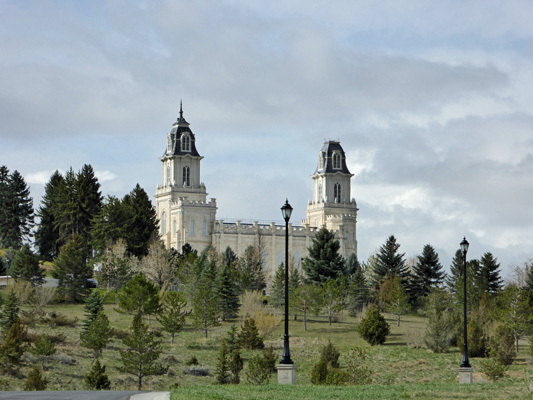 As we drove out I snapped a photo of the Manti Temple, which is on the hill right next to the park. Manti’s claim to fame is the big Mormon history pageant that is held in June each year. We drove north on Hwy 89 until we got to Hwy 132 where we went west over to I-15. We continued north on I-15 through Salt Lake. And when we got to Willard (just south of Brigham City) we turned west to go out to Willard Bay State Park, a small park on a fresh water reservoir out on the salt flats of Great Salt Lake. The boat launch at the south marina was closed due to low water so we guessed the reservoir was still down from last summer. It must have reached the ‘okay’ level in the latest storm though, since it was open when we left on Sunday. 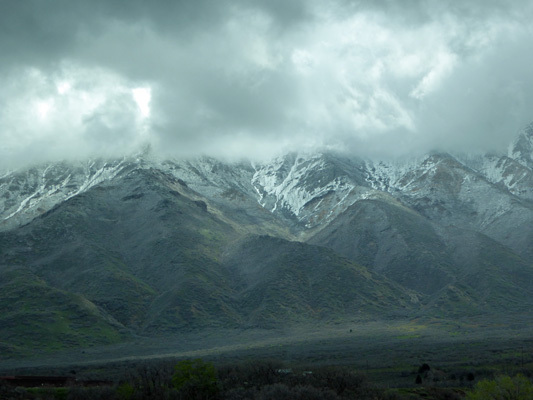 We had rain and hail (twice) on our trip north and we got some interesting views of the mountains with their tops in the clouds and new snow on their lower ranges. By the time we got to Willard Bay, we were starting to have sun breaks. It was still in the mid-40’s so it wasn’t warm but at least the bulk of the rain was over. We got a nice full hook up site (back in with LOTS of space) for $20 a night in the South Marina Campground (there are more hook up sites up in the Willow Creek Campground in the north section of the park and they appear to be mostly pull throughs). The park was pretty empty when we arrived but it filled up as the afternoon went on—it was Friday after all. 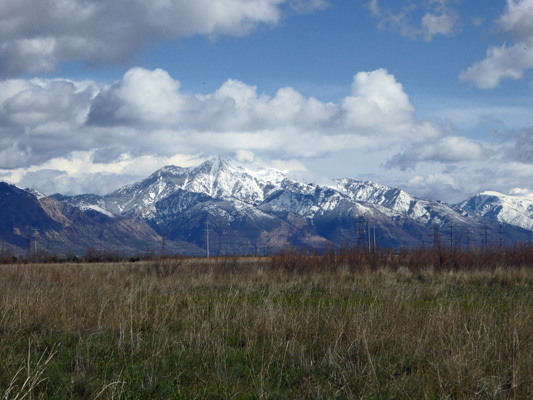 As the clouds cleared away and the sun came out I went out to take a photo of the Wasatch Range to the east. They are really pretty mountains with fresh snow on them. The wind came up in the early evening and the folks in tents really had to fight to keep them from flying away. We had gusts into the high teens (which is about all our anemometer can measure anyway.) It was a cold and windy night but we only had a low of 35 the next morning. We took the day off on Saturday April 16th and just puttered around the trailer. Walter fiddled with loose screws (it’s a never-ending project when you house is always rattling down the highway) and I worked on getting caught up on all my emails to you folks. A little after noon, it had warmed up to the low 50’s so we went for a little walk in the campground. Here’s a view of the South Marina area of Willard Bay (not a big deal as you can see). But the mountains due east from up on the dike were really impressive. By evening all the clouds had pretty much blown through but it was still breezy. 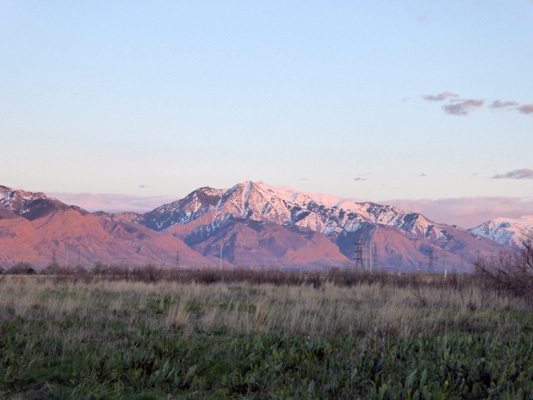 The setting sun lit up the Wasatch a nice pink. And lit the sky to the west a pretty orange. We packed up on Sunday morning (with everyone else it being Sunday and all) and headed up I-15 to I-84. 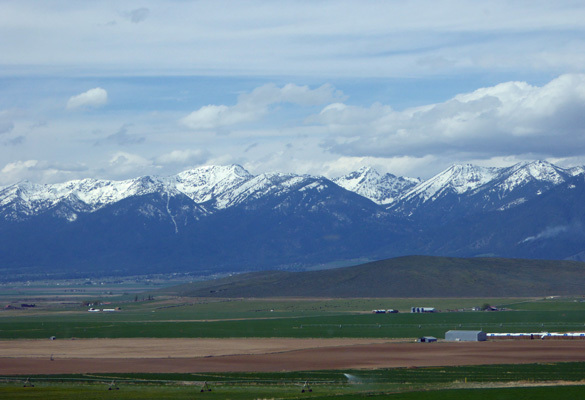 Just before you hit the Idaho border you come to the town of Snowville where there are mountains in nearly every direction. The highway turns and so the view changes. There were lots of little purple flowers in bloom in the fields (and even in the median above). 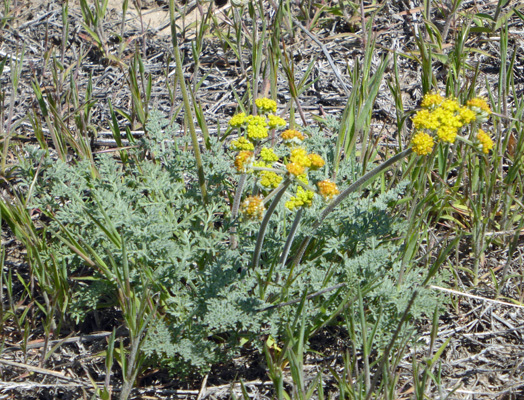 My guess is that they are blue mustard but they might be storkesbill too. We motored on through southern Idaho and took the turn-off to the little town of Hagerman (200 miles from Willard). This is feedlot country and we were amazed by how many medium-sized feedlots there were---moooooooo. 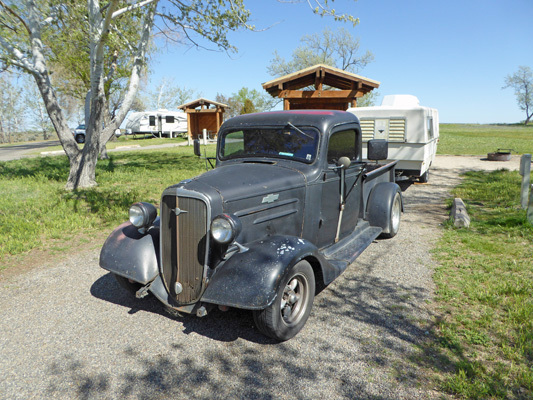 We motored through Hagerman itself and ended up at the Hagerman RV Village, a Good Sam Park, that was clearly popular with fisherman and folks who are on the road. We got a spot for two nights and were happy to find that the WiFi worked great. The wind had died down and things had warmed up some so we could even open up the windows (though if the breeze came from the wrong way there was a bit of eau de cow). The next morning we packed a lunch and headed into town to the Hagerman Fossil Beds National Monument’s Visitor Center. It’s a small place with a home-made video about the Fossil Beds (too many out of focus photos for me) but it was interesting nevertheless. They also have a display for the Minidoka Internment Camp. I hadn’t realized that they had taken all the Japanese Americans in Alaska and brought them down to Idaho at the beginning of WWII. I grew up with people whose parents had been interned in California but I guess I’d never thought about Alaska. We got information about the driving tour through the Fossil Beds and the trails (all 2 of them) and headed out to the monument itself. On the way to the monument we stopped near some purple flowers blooming in the fields. 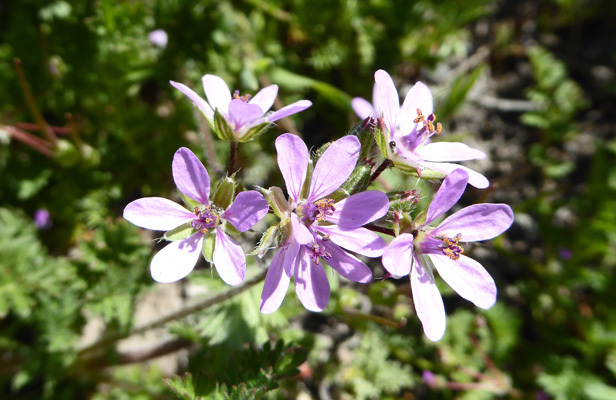 Sure enough, it was Storksbill (Erodium cicutarium). The road takes you up the hill a bit to an overlook where you can see the Snake River as it makes a turn. You can also see the layers of sand and clay that make up one of richest deposits of late Pliocene Fossils in the world. Fossils of 105 vertebrate species, 38 invertebrate species and 35 plant species have been found here to date. It also has the richest deposit of Hagerman Horse (Equus Simplicidens) in the world. The first true horse, the Hagerman horse actually evolved here in North American but migrated back over the Bering Sea Land bridge when the climate changed and it became inhospitable here. It’s bone most resemble a Grevy’s zebra though. They’ve found 20 complete fossil skeletons of the Hagerman Horse in the fossil beds here. 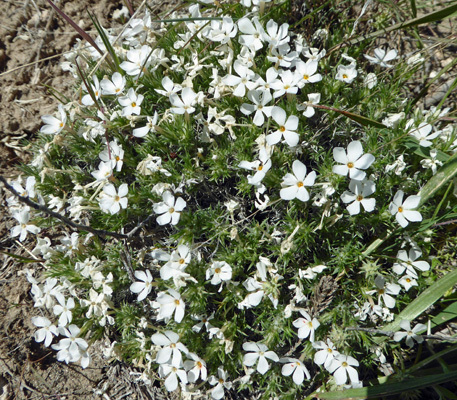 The drive continues up the hill on your left where we began to see wildflowers along the roadside, including Sagebrush Phlox (Phlox aculeata). At the top of the hill there’s a parking area and a trailhead. One trail leads to a portion of the Emigrant Trail that you can follow 3 miles down the hill (or you can start back down at the other overlook and come UP the hill). There is also a .6 mile trail with interpretive signs mostly about the Oregon Trail. 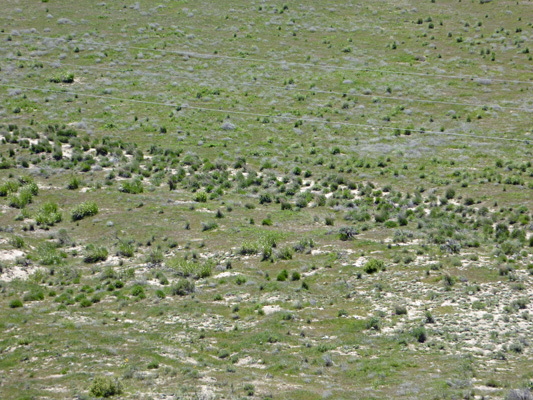 We took this loop trail out along the ridge where they tell you that you can see ruts of the Oregon Trail. This always takes some imagination but this time, I think you can really see the track across the basin before it climbs the hill. This was part of a long difficult passage for the folks on the trail. 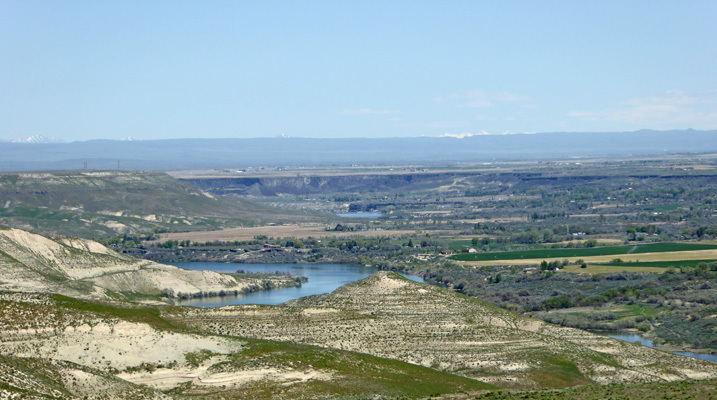 They needed to arrive in this area by late summer and it was a hot rugged passage through the Snake River Plain. 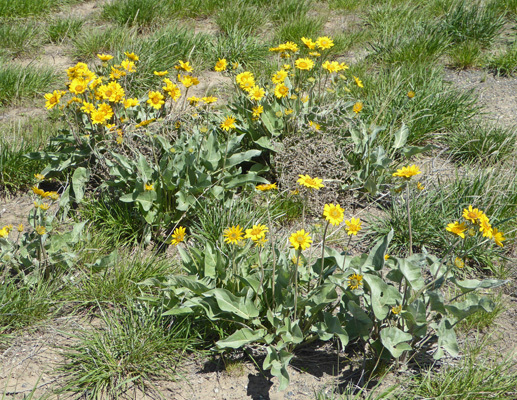 There were lots of wildflowers along the trail, including an old familiar favorite, Arrowleaf Balsamroot (Balsamorhiza sagittata). 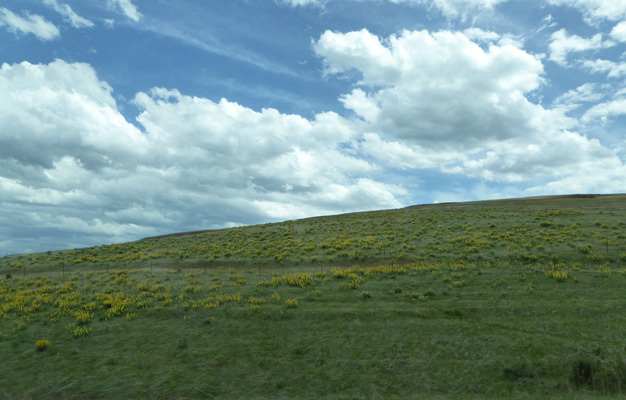 This is a very common wildflower in Eastern Washington and Oregon this time of year. 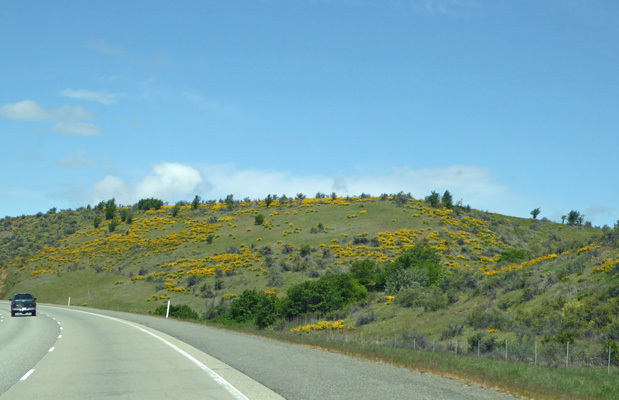 In fact we saw tons of it in bloom later in the week as we drove along I-84 in Eastern Oregon and Washington. 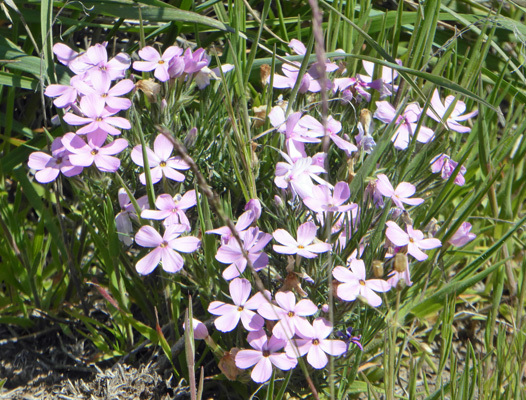 We also saw clumps of Tufted Phlox (Phlox caespitosa). 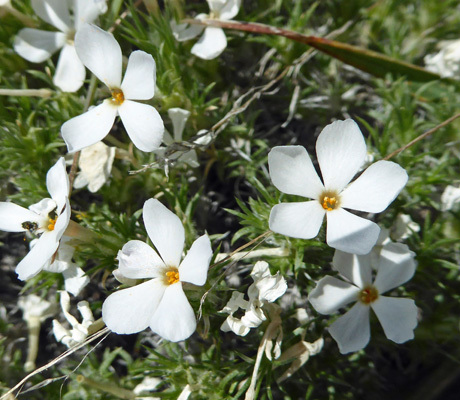 These flowers were pretty tiny even for a phlox—maybe half the size of the index fingernail. 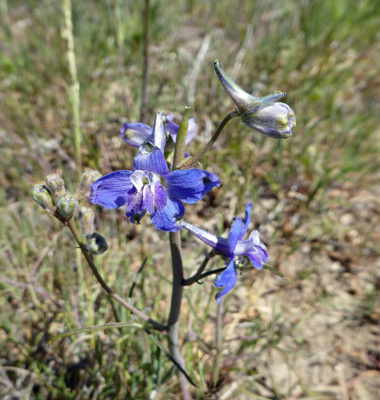 And here and there were a few small Two-lobe larkspur (Delphinum nuttallianum). 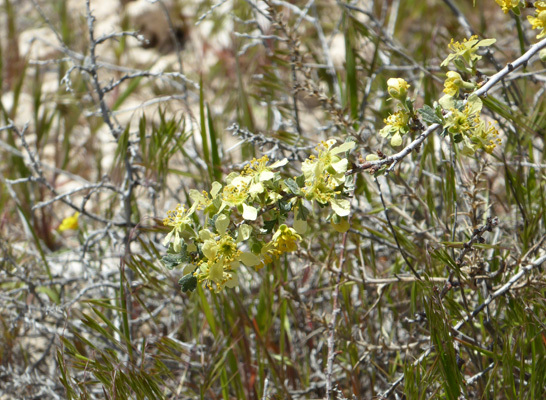 There was also one bitterbrush (Purshia tridentata) in bloom. I now understand why deer love bitterbrush—it’s clearly a member of the rose family and they do love roses. At the far reaches of the loop trail you get another view of the Snake River. 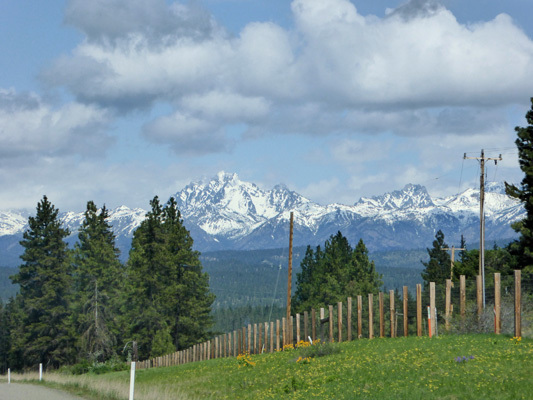 And off in the distance there were snow covered mountains that might just be the Sawtooth Mountains. We made our way back to the truck and drove out to the end of the road (or at least where it turns to gravel and heads off into the farmland after you leave the monument). 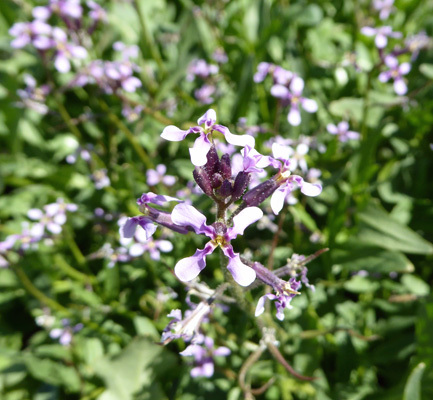 There I saw another huge patch of purple flowers that turned out to be Blue Mustard (Chorispora tenella). It’s taller than storksbill so some of the fields we saw driving across southern Idaho had storksbill in them and others had blue mustard—and the only way to tell at 60 mph is by how tall they are. 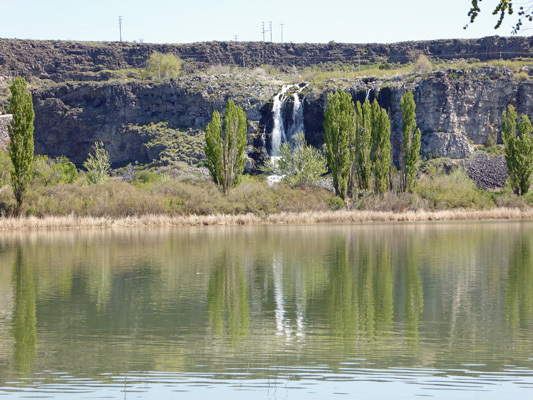 We drove on back through the monument and east along the Snake until we began to see water gushing out of the basalt deposits on the far side of the river. These are part of a short section of natural springs along the riverbank called 1000 Springs. 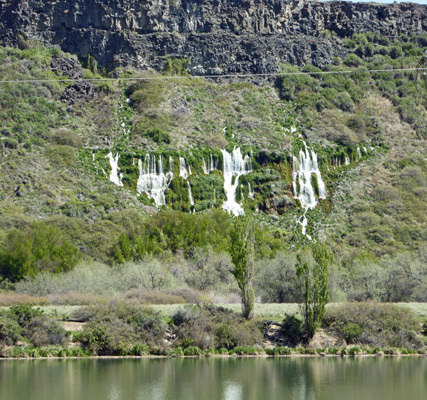 These are natural springs that are fed by the Snake River Plain Aquifer. We’d heard about an resort in this area that had an RV park and had thought we might camp here for a night and enjoy their hot tubs and pool. However, they weren’t open yet for the season. But their gates were open so I did get a nice photo of the big spring that is across the river from them. There’s also a 1000 Springs State Park that is made up of several small properties on the far side of the river. We decided this would be a great place for lunch and so we drove across the river is search of one of them. We found the state and national fish hatcheries and lots of farms but no signs at all directing us to the state parks and our map just wasn’t detailed enough to get us there. So we turned back and went to an Idaho Power Park we’d seen along the Snake and had lunch there. It was pleasant sitting in the sun—in the mid 60’s--and we enjoyed our lunch watching the river drift by. 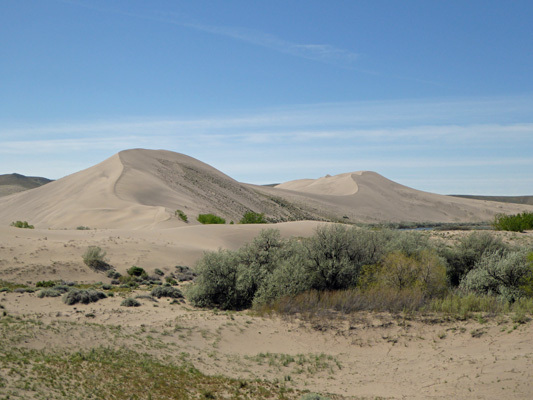 The next morning (April 19th) we packed up and headed west a little over 50 miles to Bruneau Dunes State Park. It was our anniversary (yes, we’ve been married 36 years now) and we thought it would be fun to spend a couple of days here since the last time we were here (in October 2010) we had only spent one night. The forecast was for temperatures in the 80’s and clear skies so why not? We had the time, so let’s use it to celebrate. We got a nice campsite in the Broken Wheel Campground with water and electricity for just $19.31 (this is Idaho, the home of sales tax on state campground fees) because they have a 50% senior discount at this park Sunday through Thursday that applies even to out of state folks. We paid for two nights and set up camp. It was a little after noon so we decided we’d head up to the Visitors Center and get a trail map. Oops, it was closed for lunch. 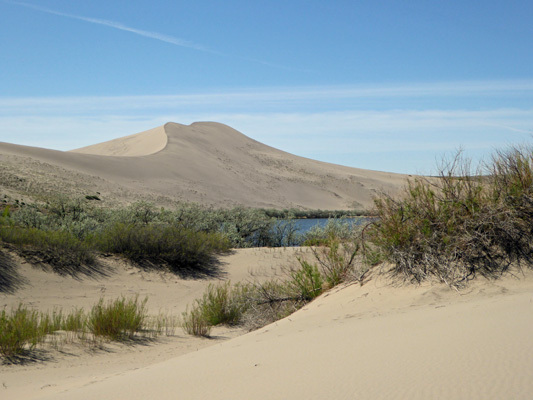 So we took a drive around the park and I took this photo of the dunes from the overlook by Little Dune Lake. The dunes here are the tallest single sand dune structure in North America at 470 feet tall. 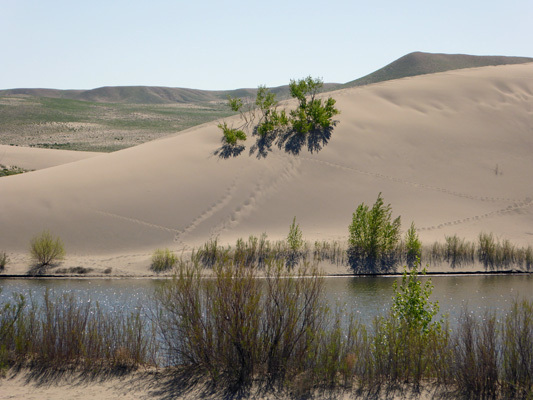 These dunes don’t creep or travel because they were created by a pair of long-term wind patterns, 180 degrees apart. The opposing winds keep the dunes from drifting in either direction and create an interesting crater in between the two biggest dunes where the wind causes a vortex and no sand accumulates. 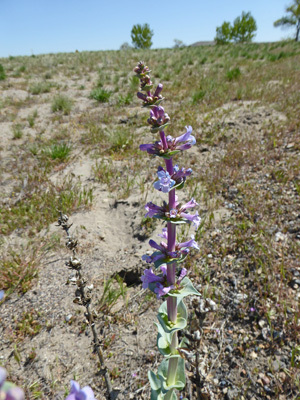 There were a few Sharpleaf Penstemon (Penstemon acuminatus) in bloom along the edge of the road. We headed back to the Visitors Center and picked up a hiking map and I watched part of an interesting video on the geology of Idaho and Eastern Washington before we headed back to the trailer for lunch and a nap! The Idaho State Parks provided Wifi in this park with 20 minutes free WiFi every 12 hours or you can pay $3 for 24 hours of access. Walter got on at about 2:30 pm and had a blazing fast signal. I got on at about 4 pm and it was so slow I couldn’t get anywhere. They know they have bandwidth problems and are looking at a different vendor. There are just too many folks with WiFi devices these days for systems designed even a year or two ago—especially systems using a cell system. The following morning, we both had a fast signal for our free 20 minutes so it does work as long as there aren’t too many folks trying to use it. The folks across from us in the campground had an old 1936 Chevy truck that they had used to haul in their little trailer. They were kind enough to let me photograph it. I do believe that’s the original paint job—though they assured me it had a new transmission so it could pull the trailer. After chatting with them, we drove back over to Little Dune Lake to take what sounded like a nice 1.3 mile stroll around the lake. In fact, it turned out to be a 1.3 mile slog through the sand (and up and down a few dunes) that took us well over an hour. 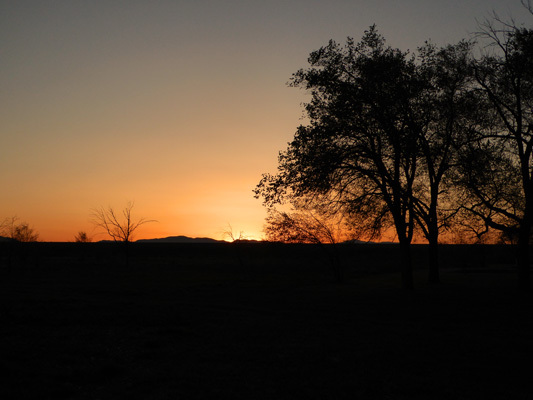 To start the trail, you hike down to the Steele-Reese Education Center which holds an observatory where you can use their telescope (for a small fee) on Friday and Saturday nights from mid-March to mid-October. This is a perfect place for an observatory because it’s far from any city lights and thus very dark and they have lots of clear nights. The trail is supposed to have a series of 10 numbered signs. We found number one and set out following the trail. 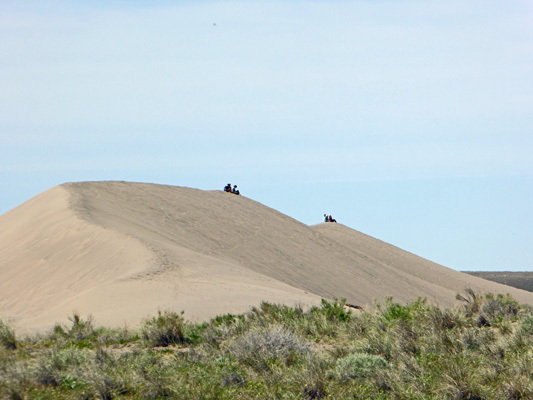 It gave us a great view of folks sitting up on the ridge of the smaller of the two major dunes. Some of them had even brought up their beach chairs. The Visitors Center had sand boards that you could rent to use to ride on the dunes. And the face of this dune is a favorite for that. In fact, they like to ride on both faces of this dune. We walked on and found the second marker and with a couple of false starts (following footprints that ended in the bushes) we found the third marker. 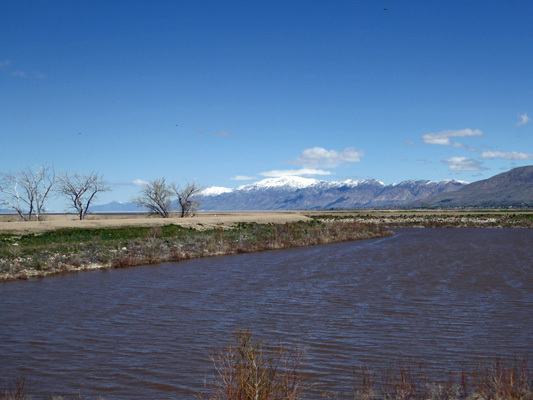 The lakes here didn’t appear until the early 1950s when local farmers started using flood irrigation using water from a new dam. All that irrigation water caused the water table to rise and presto they had two lakes here. 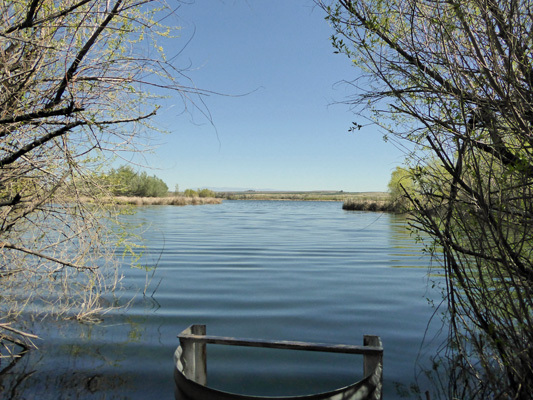 Wildlife flocked to the oasis and even after flood irrigation was abandoned the parks system continued to pump water from the Snake River to maintain the lakes. The metal structure in the bottom of this photo is the out-take for water moving from Little Dune Lake to the larger Sand Dune Lake. We walked on following the directions in the trail guide but we found no more trail markers until we reached the end of the trail where we found number 10. Sand isn’t the best thing to try to keep markers in place in I’d guess. 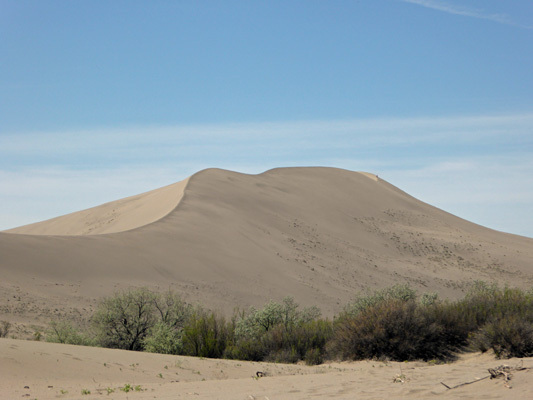 As we went along, we got a great view of the largest of the dunes which is 470 feet high. There actually was someone up at the top of the dune when I took this photo. He’s the little black dot on the far end. We hiked a bit further and we got a bit of a view of the end of Sand Dune Lake. Both critters and people leave tracks all over the sand. We slogged on and decided we’d skip the hike to the top of the ridge of one of the dunes and instead skirt the edge of the lake. This took us to the east side of the lake and a nice view. 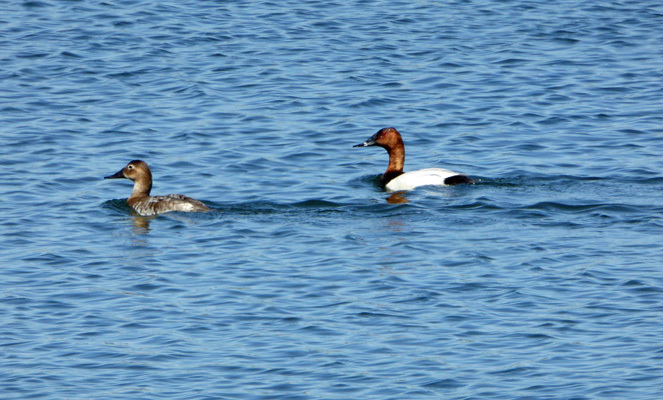 And there were even a pair of canvasbacks who stayed put for long enough for me to photograph them. The only hitch was that we hit a road block at this point. There was a ridge of sand all the way to the lake’s edge and no way to get around it. So we had to surrender and hike UP it. 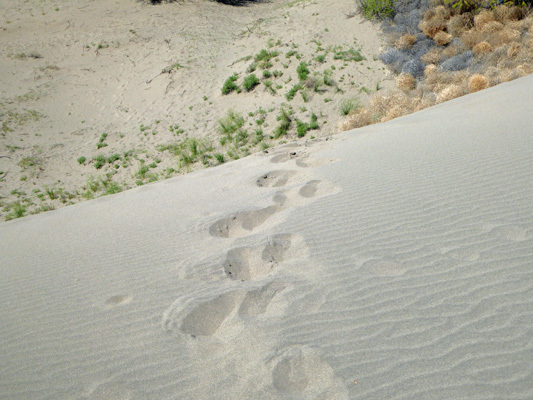 It was a struggle since this is really dry sand--even taking a diagonal route up the face of the dune--but we made it. 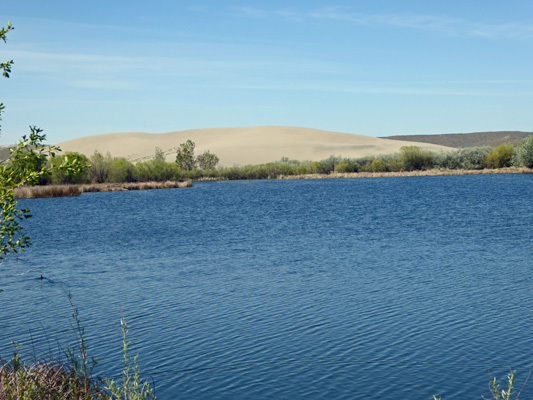 The reward was a very nice view of the dunes and a tiny slice of Sand Dune Lake. Even when we were finished hiking over the dunes, the trail really didn’t get much easier because everything is pure sand here. It was getting warmer at this point (we had a high of 85 later in the afternoon) and we were both tired. 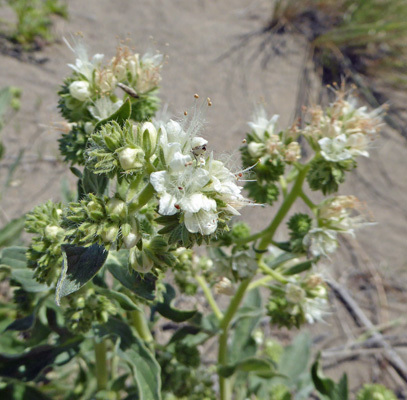 While Walter found a hummock to sit on I found a few Variable-leaf Scorpion weed (Phacelia heterophylla) in bloom. There had been lots of these in bud as we hiked so I was glad to find a few flowers to be able to figure out what the heck the stuff was. We were hot and tired (and had sand in our boots) when we got back to the truck but at least we can say we made it. I can assure you that I will not put this hike on my list of hikes I’d like to do again. On Thursday April 21st, we headed west to I-84 and made our way across the rest of southern Idaho and up into Eastern Oregon. After putting in our 200 miles we got a spot at Oregon Trails West RV Park in Baker City, OR. We’d planned to stay there 2 nights to do laundry and grocery shopping but they were booked for the weekend! It turns out that there was a big Square Dancing gathering in Baker City for the weekend. We’ve encountered lots of reasons for parks being full before but this one was a first. So we went on-line and discovered that we could get the last hook-up site at Yakima Sportsman State Park in Yakima WA for Friday and Saturday night. We grabbed it since this is a state park we haven’t visited before. And we even managed to get the laundry done that afternoon too. 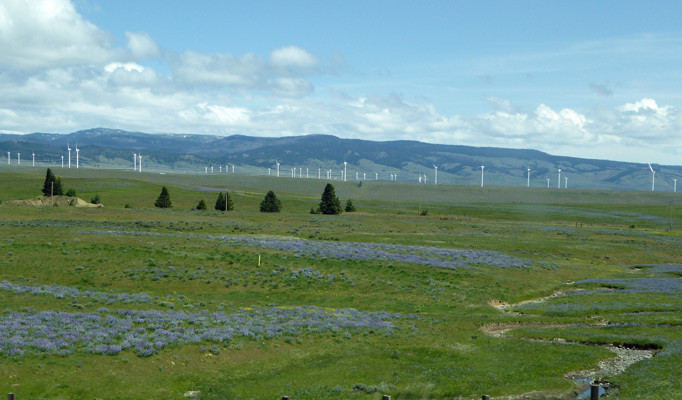 On Friday April 22nd, we headed northward up I-84. 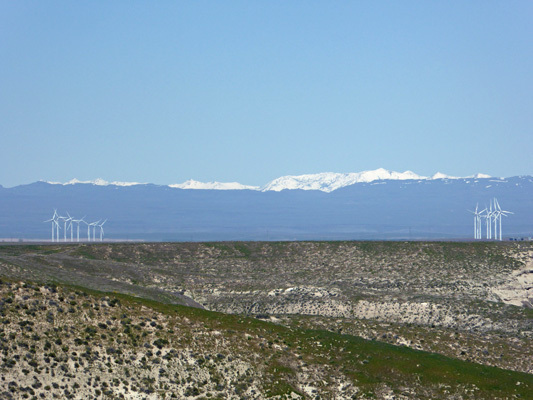 There was still snow on the Blue Mountains around Baker City. 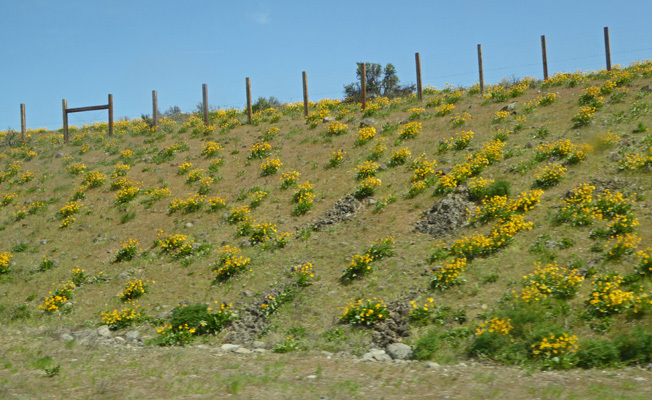 and other lovelies in bloom on the hills north of La Grand. At the half-way point we stopped to change drivers and have a pit stop. We opened the door to the trailer and were hit with a blast of wind. Huh? One of the side windows was missing! In the bustle of getting ready to go in the morning I had forgotten to double check to see that all the windows were latched. The wind must have gotten up under the edge of the window and swung it out and then it crashed down and broke! and the broken edge at the top. We stood and hemmed and hawed about what to do about it. We had a roll of duct tape in the back of the truck and a old blue tarp we always carry just in case. 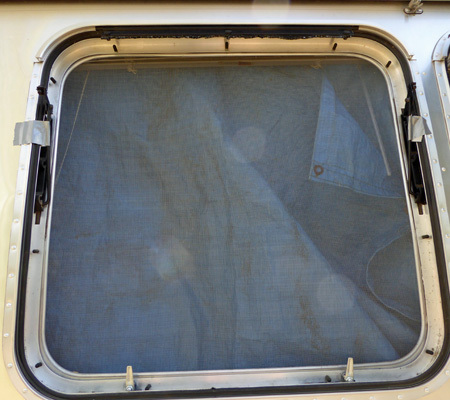 So we taped the tarp over the window on the inside and set out again. We now officially looked like ‘trailer trash’ with a blue tarp in the window. We drove a ways and then pulled off the highway to check if the tape was holding. Whew it was. 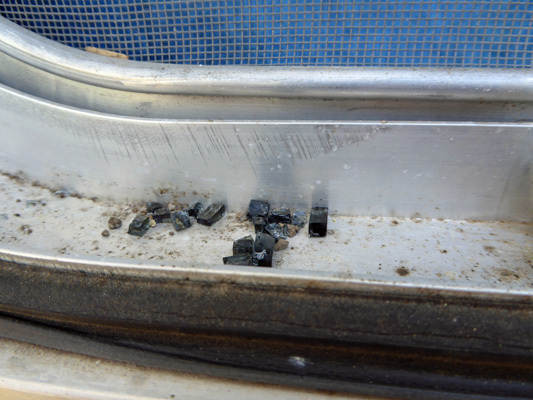 At the same time I took the time to call the Airstream dealer (where we had an appointment the coming Wednesday April 27th) to see if maybe just maybe they might have a replacement window in stock. After at first saying they didn’t, they discovered that they in fact did have one that would fit our model. Halleluiah! We’d only have to go 5 nights without a window! We spent the next portion of the drive discussing possible ways of closing off the window opening with things we could by at Home Depot. We arrived at Yakima Sportsman State Park late in the afternoon and set up camp in our nice full hookup (though fairly closely spaced) pull-through spot. Our blue tarp repair had held okay (only one little edge had come undone) and we were tired so we decided we’d wait until the next day to make our trip to Home Depot for repair supplies. The sun was out, our hot spot worked here and Walter got good TV over the air with our antenna, so life was good. 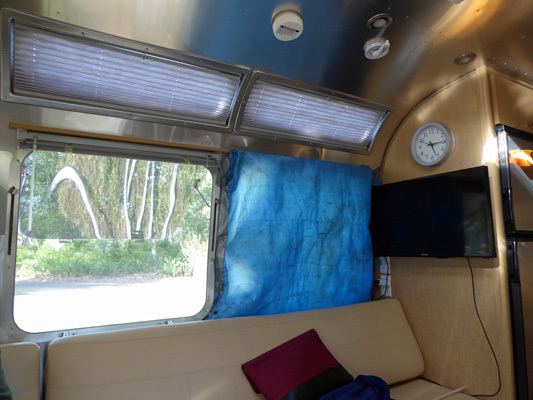 On Saturday April 23rd we trundled over to Home Depot and bought a sheet of plastic hollow core board just the right size for the window—and some wide blue tape since the Airstream dealer didn’t want us to use any more duct tape because it tends to leave too much stick-um on things. Then we did the grocery shopping and went home to tackle the window again. 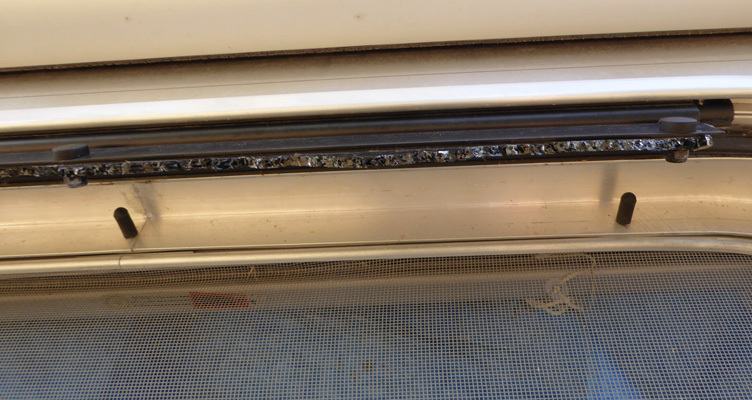 After much discussion we opted to trim the sheet to fit and tape it over the outer window flange. It worked too. It made it through the rainy 200 mile drive to Olympia the next day without a hitch. On Sunday April 24th we headed north on I-82 up to I-90 on our way to Olympia WA. 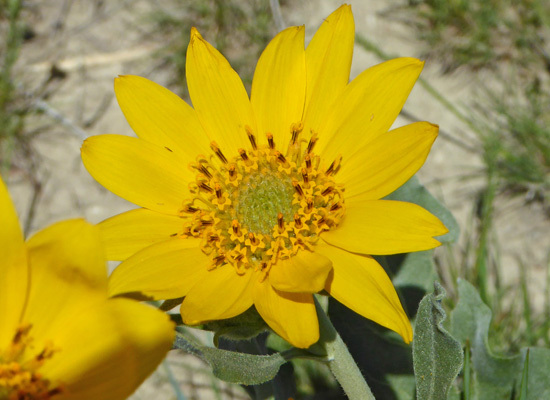 The Arrowleaf Balsamroot was in full bloom along I-90 west of Ellensburg. It just went on and on and on. 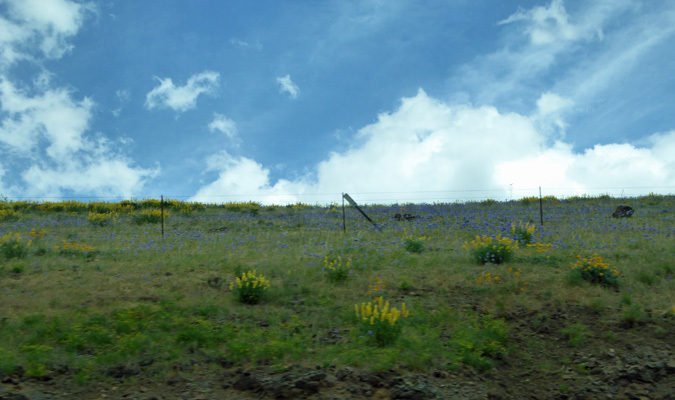 And then up near Elk Pass (where they have those high fences to keep the elk from playing on the freeway) we saw tons of lupine in bloom too. Trying to shoot photos of flowers from a moving truck is a fun project. When I was doing it I didn’t even notice the wind farm in the background. Getting a shot of the Cascades as we drove along was even more fun. It started to rain as we hit Snoqualmie Pass and we had showers off and on all the way to the Washington Land Yacht Harbor in Lacey, WA. We’ve camped here before and often times there have only been one or two other rigs there. No more! They’ve worked on getting the word out and now the long-term part of the park is full and there were another 15 or so rigs in the other half. We liked it better when there was no one here but hey it’s still a deal at $24.95 a night (with our 15% Escapee discount) for a full hook up. Monday we did errands and Tuesday we did the prep work to take the trailer in for it’s last warranty appointment (and to get the broken window replaced).